Information Asymmetries in EU VAT in its up-to-date overview of European Union (EU) value added tax (VAT) law assesses legislation, case law, and practice at both EU and national levels, in the process of examining how to minimize the risks and negative consequences associated with information asymmetries. Unlike conventional direct taxes, the application and administration of VAT depends to a considerable extent on the exchange of information between the taxable person and his transaction counterparts. In practice, the taxable person often fails to obtain necessary information from his transaction counterparts, giving rise to information asymmetries that can induce VAT assessments, sanctions, and audits. to what extent legal remedies should be employed to avoid or to reduce information asymmetries for the taxable person. 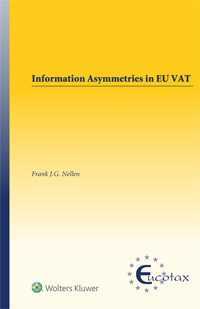 This is the first book that thoroughly analyzes the causes and legal implications of information asymmetries in the context of EU VAT, as well as the instruments that can be employed to counter their materialization. As such, it will be of inestimable value to practitioners, legislators, policymakers, entrepreneurs, judicial professionals, and academics concerned with EU VAT law.